Once upon a time, Pokemon have lived peacefully with each other. There was no war, no strife, and no worries. Battles were a sport considered to be the European football of the Pokemon world. Life was bliss. Until one fateful day when all went wrong. A meteorite containing Jirachi was flying through space when it collided with the sun. The infinite powers Jirachi possessed ran through the sun and increased it's mass. The earth orbited closer to the sun. And a war began with Kyogre. When the sun became larger and brighter, Kyogre believed Groudon to be responsible, and went searching for him. When he found Groudon sunbathing on a rock, he attacked. The battle continued until Rayquaza came down to create peace. But the Air Lock ability, which is supposed to end Kyogre's and Groudon's wars, didn't kick in because of the sun, and thus peace didn't come. Kyogre and Groudon teamed up on Rayquaza and finally killed him, before continuing their battle. As the atmosphere crumbled, Palkia came out to try stabilizing the space the atmosphere once occupied, and succeeded, but it ended in sacrifice. Arceus gave up all his strength to Palkia and dematerialized, leaving Palkia alone to keep the atmosphere from breaking apart. Wars began, natural disasters infested the planet, and chaos ruled. In the end, only nineteen different Pokemon were still alive, one of which was Palkia, who still hasn't given up. 1. People sign up, stating what Pokemon they would like to be. 2. Once we have eighteen players (now called survivors), I will randomly choose three werewolves with a RNG. 3. Werewolves will then decide on a character to murder. They will PM me their votes. Majority rules. If there's a tie, I'll have a RNG decide. 5. Participants vote, including the werewolves. Character with the highest number of votes/first to reach a certain number of negative votes shall be eliminated. 6. Repeat step 3-6 over until we have either no werewolves or a winner. 7. If a player leaves in the middle of the game, they still could be a werewolf. If a player who leaves/gets banned happens to be a werewolf I will replace them using a RNG. I am not going to tell anyone if this does happen. 8. Don't vote until the werewolves have chosen who gets murdered and that person is murdered. 9. No editing votes or posts (though if necessary, i will change the rules; i will alert the players if this happens). Also, no revealing PM's you've had with others regarding the games. That's cheating, and cheating is bad. 10. Each game brings something new. Twice in the game, between any two posts, I'll use a RNG to select one person to choose a random person to die. The person will die of natural causes, such as starvation, heat stroke, etc. The person the RNG chose to have someone killed will not be named. I'll PM you if you are lucky enough to have the RNG pick you. Dang, the RNG has a LOT of power in this game. 11. Don't bug me about the game. It isn't rigged. If it was rigged, I would have won already, and I'm not even playing. All right, hope everyone has fun!! If you need any help whatsoever, PM me. I'm not on 24/7, so try to be patient between rounds. Good luck, and see if Psypokes could finally win one, and survive the apocalypse! I am the last one remaining to Undo The Chaos! No I wont take back Dialga for ANY Reason! Just letting you know, if you DO choose a legendary, it can't be mentioned anywhere in the background. It will also be just as easy to kill as , , , you get the point. All Pokemon are treated equal in this game. i lol'd at jaypokes picking gible this time. Well, it's open registration; first come, first serve. I figured you may have signed up first anyways. Looks like I was wrong. It's not like your number will make too much of a difference. The RNG only picks a maximum of three numbers at a time, so it's unlikely you'd get picked anyways. Plus, you're still Tyranitar. That's good. Last edited by WirelessBrain on Mon Aug 09, 2010 1:59 am, edited 1 time in total. Sry, can't really do this right on my sisters itouch! But Im in! Can someone fix that for me? Hm...I just realized something weird. 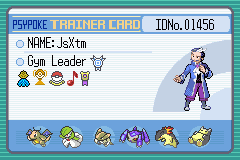 I got bored so I wrote my own werewolf game and used some Psypoke users for an example and I was only using Only first evo pokemon andbi used jaypokes as an example and gave him Gible. I just found it weird he picked Gible this time around. I know half of you will say I'm lying about picking Gible for him but i'm not and sorry about my post earlier! Oh, great. My little brother is playing. He's messi, and he's NO fun whatsoever. Say, should i link this thread in my signature? I'm thinking of it so we could start the game soon. mr. dude is bad name. its exacly the oppisite of you. you are actually ms. dudet. Thanks. The game should be going a little faster now. I will end the chaos! I like how Wireless Brain chose the pokemon you wouldn't expect. All I know is I'm going to be shot out the first round again because I can fly.